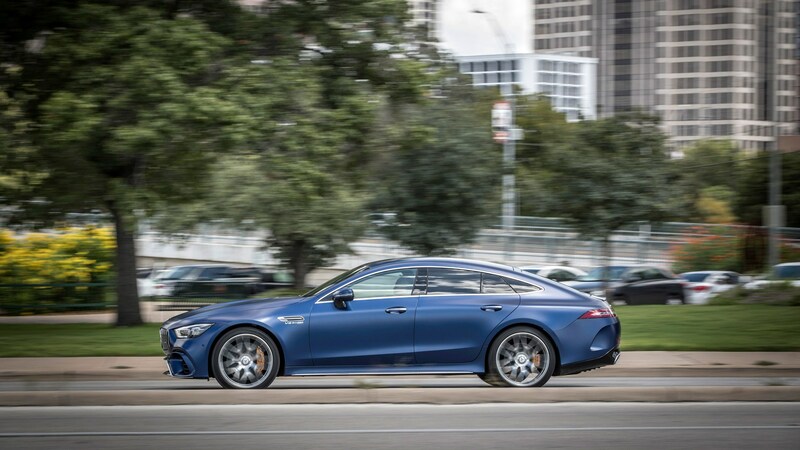 The Mercedes-AMG GT Four-Door Coupe poses a quite a threat to your cerebral cortex. It’s just a grand tourer with two extra doors, right? Nope, because it has a hatchback, and shares at least part of its architecture with the E-Class family. Externally, there are bits of CLS in there, but actually has nothing in common with it, and the two-door GT coupe’s naming convention (S, C, R and R Pro) has been booted out for a much more familiar two-number affair, in this case 63 and 63 S.
Join the club, but try to forget about it. If you’re really into your ultimate AMGs, the two-door GT might be no good for everyday use if you’ve got a family or a hobby that requires carrying bulky equipment. Let’s not say golf, but that sort of thing. 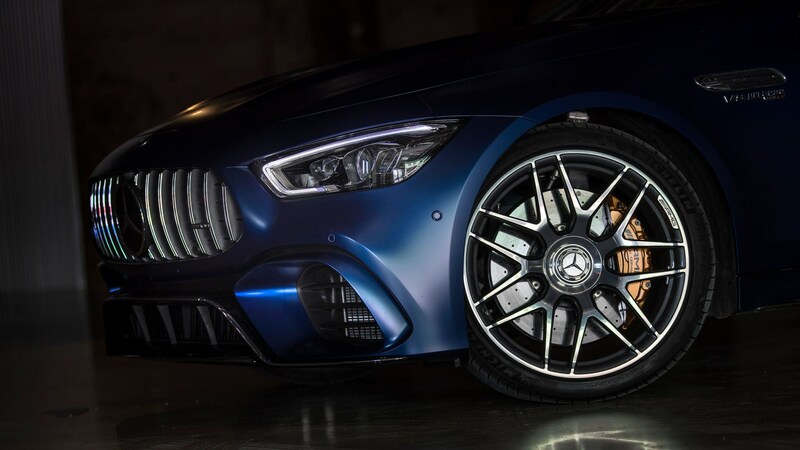 Within Mercedes you could easily plump for an AMG E63 or S63 instead but, as we know more recently, Mercedes isn’t one to avoid tripping over its own niches. Still, the most direct rival would be the Panamera Turbo, or the M8 Gran Coupe when it arrives from 2020. I’ve stopped caring about all of this... What’s the new AMG GT 4 door like to drive? It’s a very impressive thing, and that’s without the usual 'it also weighs two tonnes’ clause. 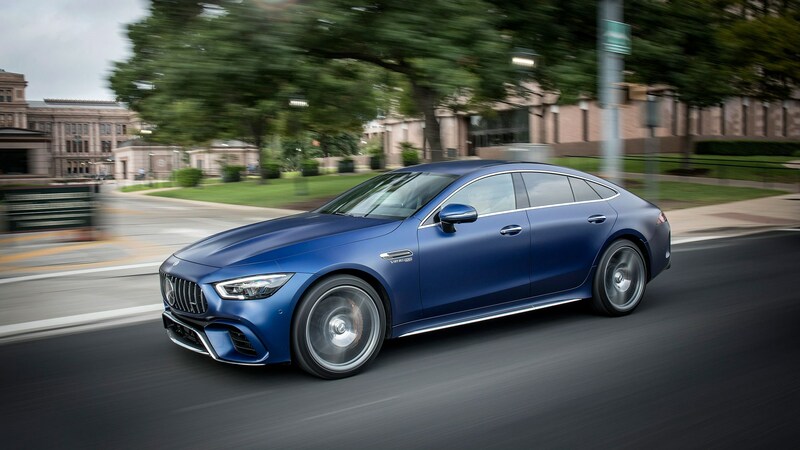 It’s not exactly like the two-door AMG GT - you don’t sit super-low looking out a letterbox windscreen at a bonnet stretching off into the distance. Our first taste of the four-door GT came in the US, where we tried the 63 S on track and road. On track, it displayed remarkable handling talent, managing to feel somehow different to the E 63 S, with which it shares 4Matic+ all-wheel drive and the supremely satisfying 4.0-litre, twin-turbo V8. We’ve been impressed by the responsiveness and breadth of power that this hot-V motor produces before but it’s just in a different league in the GT 4-Door. Some immediate differences: this car doesn’t share the GT’s dry sump, but it does get some bespoke ball bearings for the turbos to shorten spool-up time, and the power output is different too. Here you get 630bhp and 664lb ft of torque, or in other words, more than any other car the three-pointed star currently makes. Unsurprisingly it’s seriously rapid – 0-62mph takes just 3.2 seconds and feels every bit as stimulating as that sounds – and sounds even more brutal and raw while doing it. A top speed of 196mph feels easily attainable given a very long, very empty road. The amount of torque that this thing produces is staggering and it’s so easily accessible, helped by the broadly infallible nine-speed automatic gearbox, which worked so well on track that the shift paddles felt a bit redundant. It’s got a wet clutch too rather than a torque converter, so you can get off the line with minimal delay, and has so much clever double de-clutching tech you won’t be pining for a dual-clutch auto ‘box in the slightest. So, where has all this handling stuff come from? A lot of work has gone into this car to keep it as lightweight as possible - the bonnet and front wings are made of aluminium, and there’s a carbonfibre rear wall and boot cavity. These measures are slightly at odds with the sheer amount of chassis stiffening that has gone into the GT 4-Door though; an aluminium plate underneath the engine – usually only found in a cabriolet - has been deployed, as has substantial steel and aluminium bracing along the underside. The result? Turn-in is super-sharp and mid-corner grip is outstanding thanks to rear-wheel steering and that clever all-wheel drive system sending power to all four corners to ensure maximum stability. In any of the normal driving modes with the traction control system fully deployed, you can just stand on the throttle at a corner exit and let the circuitry and the standard-fit electronically controlled differential work out how much of the engine power will make it to the wheels. Sort of like driving by committee. Helping stability further is a suite of active aero including an open and shut front lower grille and extendible rear spoiler, which pops up and down to improve rear end traction faster than a European tollbooth arm. If you prefer you can swap this out for the fixed wing in high-gloss black or carbonfibre look, but we reckon this spoils the car’s attractively sleek lines. The six-pot brakes are strong with good initial bite and impressive fade resistance, although if you need more stamina for track use there is of course the option of carbon ceramic items. AMG only allowed us two hot laps of the (long) Circuit of Americas track at a time before having to pit and go back out, and found the standard brakes to be fade-free during this time, which is quite good when you think about it. Standard air suspension in V8 models features three chambers and can be set up for a good ride or strong roll resistance, depending on which of the six drive programs you choose (Slippery, Comfort, Sport, Sport+, Individual and Race) additionally taking the accelerator pedal response, gearshift and steering into account too. Moreover there are four handling programmes called Basic, Advanced, Pro and Master which correspond to different drive modes. The first three give you increasing amounts of ESP leeway, while Master, unlocked with Race mode, makes the GT 4-Door feel overall quite neutral before giving way to a bit of oversteer. If all of this feels a bit complicated, then simply select fully lit-up Drift Mode, which means you can easily overwhelm the rear tyres with all that torque, for old-school AMG thrills. We drove the ‘regular’ (if you can call it that) GT 63 over 750 miles in the UK across wintery Aberdeenshire and over long-distance motorway cruises through most of Scotland and England. The unique potholes in the UK (including some truly lethal ones in Scotland) barely unsettled the GT and the pin-sharp steering was engaging through the twistiest bits of Scotland’s road network. In fact, the ride in general is well-sorted – this is far more of a refined cruise missile than an E63. The Big E is too fidgety and has tyre roar for days – two things the GT 63 we tried was much more accomplished at dealing with. Width may be an issue for some, as some skinny B-roads do feel that little skinnier at the helm of the GT, but that’s sort of to be expected in a big four-seater. The GT four-door is another recent AMG where Mercedes has added in an artificial boost to the engine noise when the sports exhaust is activated, so there’s almost this video game-like tone in the cabin. Please bin it, Affalterbach - if there was ever an engine did not need an enhanced noise, it’s your fantastic hot-vee 4.0-litre bi-turbo V8. Which Mercedes is it most like inside? 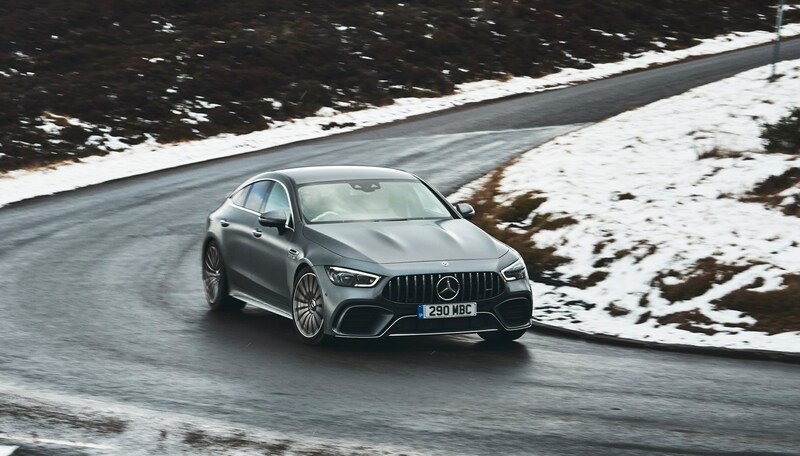 There’s a degree of differentiation here but if you already own an E-Class or CLS you won’t feel lost in the AMG GT 4-Door. 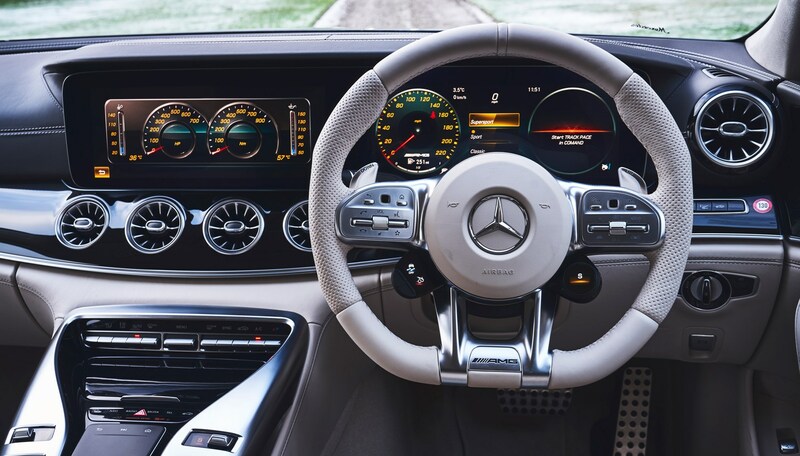 The swoopy dashboard and twin 12.3-inch screens controlled by thumbpads on the steering wheel are here, as is the extensive use of LED lighting, including in the air vents (a CLS innovation). AMG-specific things include a Supersport mode for the digital dials that gives you a large central rev counter plus a shift light when you’re in manual mode, and there’s a flat-bottomed wheel with a 12 o'clock marker, as is becoming the norm for weekend trackday warriors. Most exciting however are the new wheel-mounted controls including a round drive-mode selector with integrated display, and two customisable buttons on the other side, which you can use to change the damping, exhaust noise and so forth. The centre console also boasts a bank of animated buttons, for things like the manual gearbox mode, ESP, rear spoiler and start/stop. Each one is a tiny TFT display, with a symbol that changes in appearance or colour when you press it. In the back there are three configurations for the rear bench - two individual seats with fixed backrests are standard, and you can pick either an additional middle seat that folds, or the…ahem… High-Class Rear option. This gives you two individual folding seats and a special centre console with access to the infotainment functions and comfort features, plus wireless charging, two USBs and a temperature-controlled cupholder. 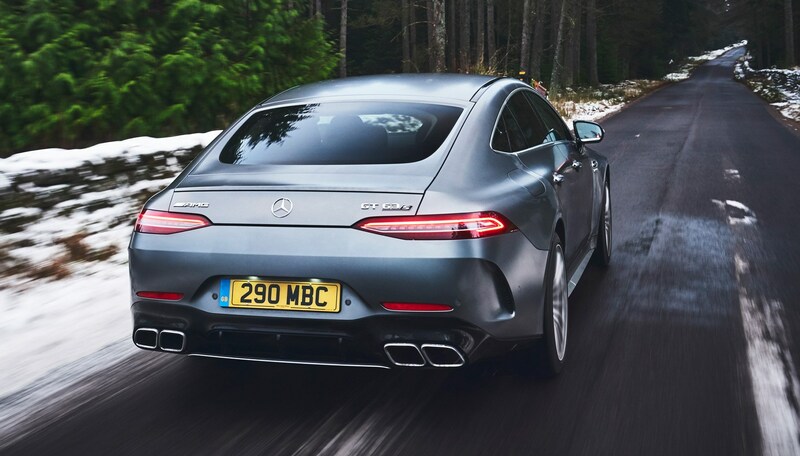 Let’s talk about boot space quickly – you get 456 litres, which is more than E-Class Coupe, less than the Saloon, and easier to access than both thanks to that aforementioned tailgate. Fold the seats (presuming you specified that option) and you get 1324 litres, which is enough for larger items. Careful not to lose items at the far end, though: if the car is dirty you'll end up getting muck on your trousers. Are there any other versions? 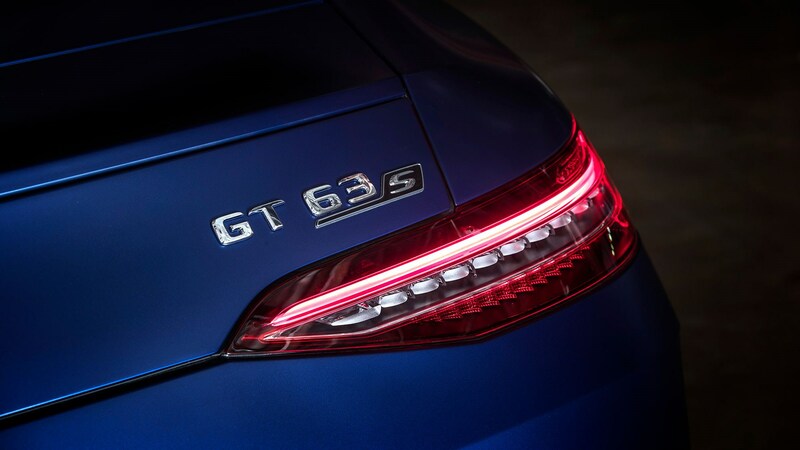 Depending on where you live – in the UK we get the GT 63 S and GT 63 (same engine, less power, takes two tenths longer from 0-62mph) but AMG also produces 53 and 43 variants for continental Europe. We just get the V8s in the UK – something most of us will surely be happy about. We think this car’s biggest issue is its name and positioning – which leads you to draw comparisons to the two-seat GT, which this car is plainly not, or the E63, which it isn’t that much of either. With all-wheel drive and rear-wheel steering and about a million different drive modes and programmes this isn’t the pure driving experience you’d get in a small sports car – but it’s no less effective. Think Eurofighter Typhoon instead of Supermarine Spitfire. Forget all that marketing noise and focus on the fact that this is a practical car you can ferry your family to the shops in or drive to a ski resort for a week, that can also flatter you on track or breeze away from more thoroughbred performance cars at a set of traffic lights. It has a more exclusive badge and image than the E 63 and considerably more anabolic looks than a CLS. A remarkable thing, really.